Someone Once Said...: ¡Mi Corazón! 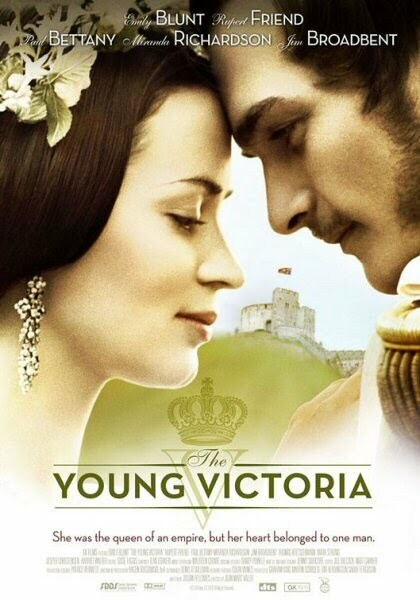 Friday night I was finally able to go to the cinema to watch The Young Victoria. I know it doesn't sound like much, but if you only knew what I had to go through to get the girls together for this my opening line would carry much more weight. The whole outing was super fun. In the end there were 4 of us (the only ones worthy of this movie and Prince Albert, so it worked out well). After dinner, cappuccinos and wandering around the mall it was time for the movie to begin. I had read reviews and knew I was going to like it - but love it? Yes, dear readers, I loved it! Quel masterpiece! It's a beautiful, romantic story that leaves nothing to be desired. The acting is superb, the costume and set design alone make it worth watching and Prince Albert is a dream. Emily Blunt is everything we hope Victoria was. I believe she did history proud. Flor: When I get home, I'm going to slap HRH across the face and before he knows what hit him or why I'll say, "Why can't you be more like Prince Albert? What's wrong with you?" Greti: I'm going to make James watch this movie 10 thousand times to train him how to be like Prince Albert. Tati: (Still weeping desperately 15 minutes after the movie is over) Prince Albert is now my reason for living. I want Prince Albert! Angie: (very much the killjoy) I wonder if Prince Albert jumping in front of the bullet is historically accurate? Tati and Flor in unison: IT'S ACCURATE!! BTW, it is accurate - although they don't know if Prince Albert was injured by the assassination attempt or not. See this link for more info - in case you're curious. Thanks for the tip. I definitely want to watch this movie now. Heh, my boyfriend saw this movie first and LOVED it! He was the one who recommended it to me! Great film.